UVa has earned a No. 1 Seed in the NCAA Men's Basketball Tournament for the fourth time in the last six seasons, and the seventh time in program history. CHARLOTTESVILLE, Va. (WVIR) - UVa has earned a No. 1 Seed in the NCAA Men&apos;s Basketball Tournament for the fourth time in the last six seasons, and the seventh time in program history. The Cavaliers are the top-seed in the South Region, and they will face 16-seed Gardner-Webb (23-11) at approximately 3:10 PM on Friday in Columbia, SC. The winner of that game will take on the winner of 8-seed Ole Miss and 9-seed Oklahoma on Sunday. The Rebels and Sooners will square off in the first round at 12:40 PM on Friday. Tennessee is the 2-seed in the South Region, which will hold its Sweet Sixteen and Elite Eight games in Louisville, KY on March 28th and 30th, respectively. 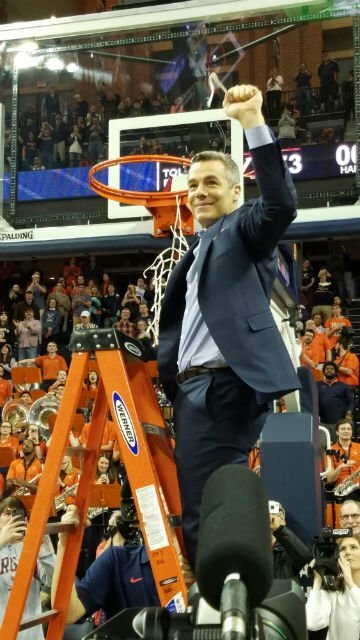 UVa has secured a berth in the NCAA Men&apos;s Basketball Tournament for the sixth year in a row, which is the longest stretch in program history. The Cavaliers put together another dominant run this season, with a record of 29-3 overall. They went 16-2 in conference play, and won the ACC regular season championship for the fourth time in the last six years, and the second year in a row. Head coach Tony Bennett says, "When you&apos;re awarded the One-Seed, it&apos;s a product of a heck of a season. It&apos;s kind of over the body of work, and the fact that these guys had the year they did in the conference, the way they did, three Number One Seeds from the same conference is impressive. You&apos;re just excited to find out who you&apos;re gonna play, where you&apos;re gonna play, and all those things. Just thankful. Thankful these guys have had the year they had, and now we know it&apos;s time to prepare well, and be ready to go." Virginia has the nation&apos;s Number-One scoring defense, giving up just 54.6 points per game. That&apos;s four-points better than the next-closest team. The Cavaliers&apos; seven No. 1 seeds in the Big Dance are the fifth-highest total in college basketball history. For just the second time in NCAA Tournament history, one conference was awarded three No. 1 seeds, as the ACC&apos;s UVa, Duke, and North Carolina earned three of the top four spots. The Big East (UConn, Pitt, and Louisville) accomplished the same feat in 2009. The commonwealth of Virginia had five teams selected for the tournament on Sunday, with 8-seed VCU, 12-seed Liberty, and 14-seed Old Dominion joining the &apos;Hoos and Hokies.